Hey guys. If I sound a wee bit sad today it’s because Susan is back in the office after being out for a glorious 5 work days. It’s taking me some time to get used to her again. To welcome her back, though, I was thoughtful enough to leave her a photo on her desk. 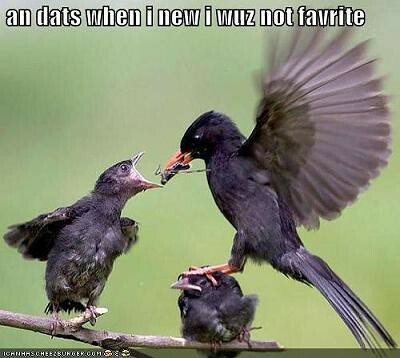 I think she knows which Tech Writer is which bird, don’t you, Susan? [I put it on my bulletin board as a permanent reminder of how much better my life is going to be when firing you finally works. –Susan] Yikes, time to up the meds, killer. I have a new obsession. It’s called LOLSecretz and it’s a beautiful hybrid of LOLCats and Post Secret. No, it has nothing to do with anything, I just felt like sharing. Moving on then. Greensboring.com helped me to discover the #1 FireFox extension in the universe. What does it do, you ask? Whenever you hit Stop in your browser, it sings the phrase “Stop. Hammer Time”, and yes, it is just as awesome as you would imagine it to be. [It slows down productivity like woah because you stop every page from loading about four times. –Susan] Did you just say “like woah”? And Bruce still employs you? Also from Greensboring.com: The Scooby Doo Mystery Machine is for sale! Score. Coming back to search for a bit, there’s lots of speculation that tiny, little Vanessa Fox is worth $30 million. That’s pretty impressive. I think I’m worth 7 Fruit Loops. Five if the Fruit Loops in question are red or blue. [In case people are about to claim that I should pay her more, I’d like to point out that I gave Lisa a bag of Fruit Loops. By her own estimation, she’s now overpaid. –Susan] But I already ates them. Now I need more fundz! Greg Boser is calling for SEOs to put on their thinking caps and decipher 50 SEO-inspired vanity plates. Greg will announce the winner next week and the lucky individual gets an all expense paid trip to Pubcon in December. Andy Beal is paying people to read his blog again. I mean, he’s offering a “prize” if you tell everyone why you love Marketing Pilgrim so much. I don’t have $500, but if you write a blog entry telling the world why you love the Bruce Clay blog, I’ll keep you in my prayers at night. I hear He pays a lot better than Andy. Or at least the benefits are higher. Philipp Lenssen posted a video depicting what would happen If YouTube Comments Met Real Life. Basically, we’d all suddenly be inflicted with Tourettes. Bulletin Board Forum gave users instant access to their favorite pop videos of the greatest decade of them all – the ’80s. Today needs more New Kids On The Block, don’t you think? Hang tough! The crazy people over at How To Wake Up Early gave us 9 reasons why you should wake up early (go figure). In response, I give you one reason why you should sleep in – all that extra sleep! The Wall Street Journal reported that those trendy little tattoos females have been getting on their lower back may actually kill you. Okay, I lied, they won’t kill you, but they do make getting an epidural quite risky. Anyone who knows me knows that I. Love. French Fries, but even I wouldn’t eat Applebee’s French fries. So many ews. Alaska Airlines will soon offer inflight wireless Internet. Score! Sadly, it won’t be ready in time for my flight with them in December. Darn. Transparent frogs, transparent frogs! You can see what’s in their bellies! Those crazy Japanese people have come up with yet another wacky invention – an electronic bubble wrap toy. I have officially added it to my Christmas list (along with this new Seatbelt bag! Hi Mom.). Urban cup holders come in handy for when you’re standing next to a street post with your cup of coffee and you suddenly realize that you need both your hands. Because, you know, that happens a lot. Especially here in Simi Valley, CA. Rugs made of (fake) leaves help New England girls to feel at home even when they’re living in Southern California. Sigh. A man woke up during an autopsy because the pain was “unbearable”. Ohmygod. I’m offended that you think I’m paying people to read my blog.